The Eagle (the butterfly?) has landed! It's 5:01 am and August in Slovakia, but here it's 10 pm on the same day we departed from Vienna. Long day! But a very good travel day all around. Busy day tomorrow: we have to buy a car to drive to Philly for my approval interview on August 6. My dad has been doing research, so we're hopeful for a good/relatively painless day of shopping tomorrow. Thanks for the "safe travels" prayers! Daniel, a Slovak pastor and member of my internship committee, recently invited me to preach at his dad’s congregation in Háj, a small village in central Slovakia. The assigned preaching text for the day was Matthew 28:16-20: the Great Commission. As I prepared my sermon, I imagined that the disciples’ doubts that day on the mountain in Galilee were similar to my doubts at the missionary sending service in Kenosha, Wisconsin: what if I’m not good enough? Will my friends and family ever understand why I’m doing this? Am I up to this task?The great thing about this story is that Jesus sends the disciples out—Jesus sends us out—anyway. He doesn’t wait for us to be certain, doubt-free, or perfect. We are sent out, not because of what we’ve done, but because of what God has done: loved us, forgiven us, and empowered us to do things we could never do on our own. 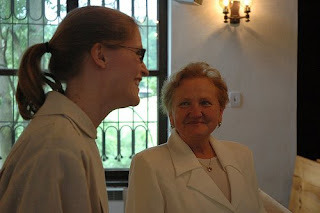 During the second service in Háj, my eyes kept going back to a woman in a beautiful white suit. As I preached, she smiled. “Keep going!” she seemed to be saying, “You can do this!” Daniel told me later that Anna is the president of the congregation, and that her granddaughter attends seminary in Bratislava, but is currently serving as a summer intern at Dr. Martin Luther Evangelical Church in Muskegon, Michigan. I realized that, on the same Sunday morning that Anna was encouraging me, someone in Michigan was probably looking at her granddaughter and smiling, letting her know “You can do this!,” even in the midst of any doubts she has. Jesus meets us, and sends us out, in the midst of our doubts and imperfections. That’s good news for missionaries, and for the people we minister with, too. This post appeared on Hand in Hand, ELCA Global Mission's blog digest with contributions from missionaries all over the world. Check it out. ... attempt to teach the Trinity in the last five minutes of class, only to have my students call me on it with fantastic questions, like: "If Jesus is part of God and God is one, why does Jesus say, "My God, why have you forsaken me?" 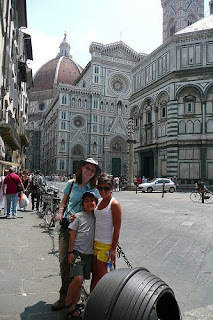 ... meet a wonderful family from Ecuador at a bus stop in Assisi, and end up spending a good part of the day with them in Florence. I think Sean and I both knew we were in for an adventure a year ago, getting antsy at the Summer Missionary Conference ... both ready to go and not at all ready to go. We guessed that we would come to love Slovakia and the people we work with, here. Ultimately, we were always just long-term visitors here: called to be partners, but also to remain outsiders. And yet ... we've become more invested than the average visitor, more at home than the word "outsider" implies. 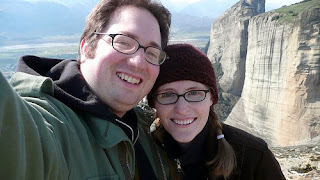 Sunday will be my last service at BIC--David and Carla left for the US this morning, and I woke up with a strong sense of loss (and then went back to bed.) We are packing and getting ready to go, but not in a particularly stressed out way. Keep us, and the many, many missionaries in transition right now, in your prayers. Before we even got inside, however, there was, in good Slovak tradition, a program. A military band played surprisingly swingy, poppy tunes; majorettes twirled flawlessly; men in feathered hats shot blanks at each other in time to music, making us all jump and hold our ears in a delighted way. A well organized corp of the president's guard marched out to the center with their rifles to "Carmina Burana." As the group got into formation, the music quickly changed to "Misirlou", then to "Sweet Dreams Are Made of These" by the Eurythmics, and a professionally but also whimsically choreographed routine with dance and rifles unfolded. Another techno/dance tune followed, and Sean and I grinned at each other as we strained to see over the (now huge, excited) crowd. At the end of the routine a new song came on; perhaps it had been added that morning. The soldiers marched in formation, stopping once to point their white-gloved hands to the sky. This version of Billie Jean made me remember all the other times I've heard that song this year: done in a Cab Calloway style at the Easter Market in Vienna, at various Lyceum events, while we shop for groceries at Billa. I will never forget this version: standing in the sun in front of the presidential palace in Bratislava, surrounded by Slovak school children, watching the precise choreography of the president's guard, hearing the MC announce after the routine, in Slovak, that it was dedicated to the memory of Michael Jackson. It was just right. I am going to miss this place. Audrey and Curtis were visiting us. The Palace Cinemas have assigned seats--they are clean and comfy and the most pleasant movie-going experience imaginable. Real butter for my popcorn? Yes, please. Slovak (or are they Czech?) subtitles are always cool and interesting to try to follow. The crowd loved it. This should be expected of a wonderful new Trek movie, but it was especially wonderful to experience outside of the US. What's not to love? It's a great movie. It makes me want to lose several days of my life watching all the Star Trek I can get my hands on. I will not do this anytime soon (sermon to write, project to get underway, paperwork ever-looming, worship to plan, classes to teach ...) but I hope to have a marathon at the first opportunity. Palm Sunday had everything: procession with palms, a children's play about donkeys, the Passion reading, a baptism, communion with a huge crowd ... when David showed me his watch during the last hymn I couldn't believe it. We were right on time. Trust your supervisor, padawan. On Wednesday after chapel the teachers went out for lunch at a nice restaurant by the old bridge with outdoor seating. Outdoor seating has become a key motivator in our lives. You would not believe the gorgeousness of these days. It is as gorgeous now as it was hailing and sleeting every day about 2 weeks ago. On Maundy Thursday I gave a children's sermon and, with the help of the BIC kids, did some footwashing. I'm not sure I can convey it, but it was both fun and sacramental. I gave a sermon with the theme, "If you're a disciple, your feet are going to get dirty." Jesus washes the dust of sin, death, and everyday weariness from our feet; as the body of Christ, we do likewise for each other. We hope to get that sermon (and a backlog of other BIC sermons) posted on our website, soon. Near the start of the service Sean and I joined David and Carla singing a shapenote arrangement of Amazing Grace; I couldn't catch my breath but it was still a dream fulfillment moment for me to sing soprano in a gospel quartet. On Good Friday I got to be an acolyte, which I really do enjoy. David's sermon, "How close is God?" included the line: "You cannot be alone." In the midst of this David and I did a good bit of preparation for the services and we managed to work enough through the week that Saturday was free. Sean cooked and cooked in preparation for the Easter potluck. I slept most of the day and went to bed early. On Easter we baptised a sweet one-year-old boy and had a pretty great service all-around; one of our youth played trumpet, which I think is what really "made it Easter" for me. In David's sermon he proudly identified himself as one of the "April fools" ... "foolish" enough to believe in the "foolishness" of the cross, the way Jesus defies every expectation. We had a really good potluck where there was enough food for everyone (!) and it was quite delicious. Then a nap. Then one of our teacher friends (and later David and Carla) came over for grilled burgers, toasted marshmallows, chocolate bunny and stargazing on our deck. The next morning we took the train to Vienna to do nothing for two days. It was glorious. This picture from the Schönbrunn gardens sums it up pretty well. More pictures here. Every year we sing the same hymns, but every year I catch them a little differently. This year it was the last verse of "O Sacred Head, Now Wounded," which we sang on Good Friday: "Lord, be my consolation; shield me when I must die; remind me of thy Passion when my last hour draws nigh. These eyes, new faith receiving, from thee shall never move; for he who dies believing dies safely in thy love." This tied in well with David's sermon message: you will never be alone. Even if your eyes DO waver, even if doubt and fear fill you at crucial moments--we are always safe in God's love. Easter, with its resurrection joy and hope, is especially welcome in my family this year. Blessings on you and yours as you celebrate: Christ is risen! He is risen indeed! Alleluia! My Grandpa Swift died on Monday, March 9. He'd recently started dialysis for kidney failure. This morning, a group of friends from church and school gathered at our apartment for a short "saying good-bye" service, and right now my family is gathering in Pittsford, NY for the funeral. I am so grateful for the support of our friends and our community of faith here in Bratislava! At the funeral, my mom will read the eulogy I wrote this week, which I pasted below. I love that my dad found a photo to go with my memory of Grandpa making that amazing red hot applesauce. The eulogy text is below. For photos, obituary, eulogy audio and a guestbook where you can leave or read memories of Grandpa and/or condolences for the Swift family, go to this website that Sean made: www.edison-albright.com/paulswift. 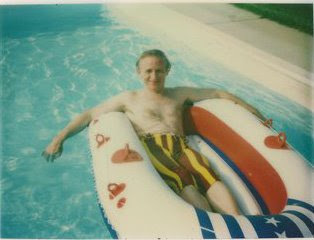 I have many favorite photos of Paul Swift, my grandpa. Some of them aren’t actual photos—just vivid snapshots in my memory. 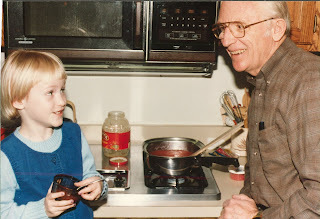 There’s grandpa standing over a stove at Christmastime, making me my first bowl of what would become one of my favorite treats: applesauce with melted red hot candies. There’s grandpa at my high school graduation party, out on the back porch surrounded by teenagers who sit in a semi-circle at his feet, gazing up adoringly at him as he talks about literature, mathematics, art and classical music. There’s grandpa sitting in the cool, airy library at the house in Maine where we had two reunions, happily holding baby Monica in a beam of sunlight. You, too, can probably imagine a favorite picture of Paul Swift holding a baby; grandpa loved holding babies. “We moved to a much better site on the coast. We spent much time in the ocean. We took our big mattress bags, wet them and ran with them to blow them up. The end was tied in a knot and the result was a big float. I laid on mine and went paddling out into the ocean. Everything went well until I noticed I was far from shore. I cannot swim so if the knot in my mattress came undone I was a goner. Somehow the water washed me up on the beach. I had left my shoes near a bamboo-and-stick shack, and not only were [the shoes] not there, but I didn’t recognize any of the other soldiers as my friends. I was certain that I had died. On March 9, 2009, Paul Swift floated away from shore one more time. He paddled out onto the waters of a lifetime of memories: that makeshift mattress-bag float in the Pacific Ocean, the smell of bananas coming from the port in Panama, London rains, cold shocks of ocean over rocky beaches in Maine, Fourth of July bonfires reflected on Conesus Lake, and sunsets sparkling on the Gulf of Mexico. These waters flowed together into a source water: the water of his baptism. The water that bathed his head in promises, that carried and sustained him through his life of faith, now carried him even farther from shore. It was the only shore he’d ever known, and he couldn’t swim. No one could swim this one on their own. That’s frightening. But the promises that were made to Paul in baptism—that he is a child of God, that his sins are forgiven, and that he will share in the resurrection hope of eternal life—these promises are the most reliable flotation device, ever. Sixty-four years after this experience on the ocean, Paul Swift died. He was carried safely to that distant shore by the promises of his baptism, the hope of the resurrection, and the prayers and loving thoughts of his family and friends. Some of these family and friends are here today, some join in spirit from their homes across the country and around the world, and some of the saints who have gone before are with us, too, part of the great cloud of witnesses. Together we gather to grieve and celebrate. Together, we hold tight to each other even as we let go. Waving our damp tissues, we say “bon voyage, rest in peace. We love you. We miss you. We will remember you, always.” And we join Grandpa in saying: “How good it is to be alive, after all!” How good it is for Grandpa Swift, as he starts this new, eternal life with God. Loving God, we are missing our grandpa, father, husband, brother and friend, Paul Swift. Thank you for welcoming him to his heavenly home, to his new life on a new shore, with all your love and compassion for him. Be with us as we mourn our loss, celebrate his amazing life, and give thanks for his new life with you. We pray, trusting in your mercy, Amen. This is a Flickr badge showing public photos and videos from novelgazer. Make your own badge here. I'm the pastor of Redeemer Lutheran Church in Stevens Point, Wisconsin. I'm married to Sean; our baby's name is Walter and our dog's name is Hank. You are welcome, you are most welcome, you are very welcome here! The Shoeless Seminarian Is Finished Internship!